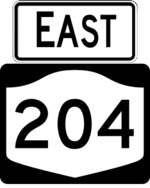 NY 204 is a short freeway connecting I-490 to NY 33A. It was intened to connect the western suburbs of Rochester with the airport, running along Brooks Avenue to end at I-390 on the north side of the airport. This extension was cancelled due to resident opposition and a lack of growth on the west side. 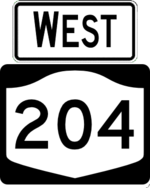 The interchange stub with NY 33A was reconstructed into an at-grade intersection in the 1990s.